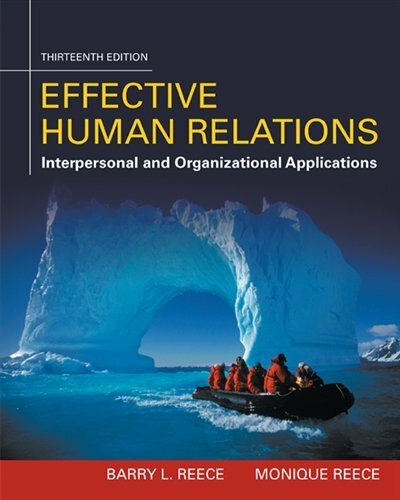 1305576160 -As one of the most practical and applied texts available, EFFECTIVE HUMAN RELATIONS incorporates hundreds of examples of real human relations issues and practices in successful companies. The authors continue to build on the latest workforce developments, global trends, and communication technologies that influence human relations. Self-assessments and self-development opportunities throughout the book teach students to assume responsibility for improving their personal skills and competencies. This comprehensive 13th edition addresses topics of emerging importance, with expanded coverage of generational differences and changing issues women and men face in the workplace. The text explores goal-setting, the root causes of negative attitudes, the importance of “personal branding” and social media in the job market, emotional intelligence, happiness and positive psychology, and the most vital elements organizations need today to create a dynamic and thriving company culture.